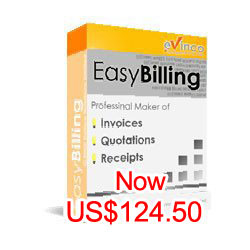 EasyBilling Software - Professional Maker of Quotation, Invoice, Receipt and Delivery Note. Frequently Asked Questions. Q: Does EasyBilling support multiple companies? A: Yes. EasyBilling allows you to setup different workspaces for different companies. In each workspace, you can have its own settings (header, logo, numbering, etc) and have own folder for documents. Q: I've two licenses of EasyBilling. Can I connect two EasyBilling to same database? A: EasyBilling is a standalone application, and does not have network/multi-user access features. However, you can set the Data Folder (we called it workspace in EasyBilling) to a network drive/shared folder, so that EasyBilling from different computers can access the same "data". In EasyBillng, you can set your workspace in menu "File > Switch Workspace"and create a new workspace in a network drive. In EasyBilling of another computer, you can set the workspace folder but choose "Connect existing workspace". EasyBilling in different computers cannot access the workspace at the same time. As the database is locked when EasyBilling is running, EasyBilling in other computers can only connect the same workspace in READ-ONLY mode. Q: How can I use Dropbox to share my EasyBilling database with another computer? A: It is possible to sync EasyBilling data with Dropbox, but you need to be careful to ensure that EasyBilling is only running on one Computer at a time. You need to install EasyBilling and Dropbox application on both computers. Please ensure you've install the same version of EasyBilling on both computers. The Dropbox application should sync the local folder in your computer to the cloud. In Computer A, Dropbox is synced to C:\Dropbox\ folder, for example. You can first create a empty folder (says C:\Dropbox\EasyBilling) under your Dropbox folder. Then in EasyBilling, you can create a workspace and choose this C:\Dropbox\EasyBilling\ as the workspace folder. After that, you can quit EasyBilling in computer A. In Computer B, assume Dropbox is synced to D:\Dropbox\ folder. Please wait and ensure all the files under D:\Dropbox\EasyBilling\ folder is synced completely. You can then start EasyBilling in computer B. You also need to create a workspace but choose "connect existing workspace" and choose the local folder location of your dropbox. (ie. D:\Dropbox\EasyBilling\). And these folders are synced to the cloud with the help of Dropbox desktop software. Q: Can I put my company logo into the document? A: Yes. You can upload your company logo into EasyBilling and set it in the document header. You can set it in "Company Information" under "Settings". Q: Our company has own set of terms used in the quotation. Is it possible to change those wordings? A: All the wordings in the documents can be changed. You can change them in "Document Label" under "Settings". The changes will applied to all the created documents automatically. Q: How to add additional payment/shipping terms? A: You can specify the Payment Options/Shipping Options in the"Define Terms" under "Settings". Once you define the term here, it is available to pick up in the document. Q: What kind of viewer is needed to view the document? Q: What kinds of export format EasyBilling supports? A: All the documents can be exported into PDF, XLS (excel), andHTML formats. Q: Will you help to build additional types of document into EasyBilling?